PSAA’s tour program is one of a kind. 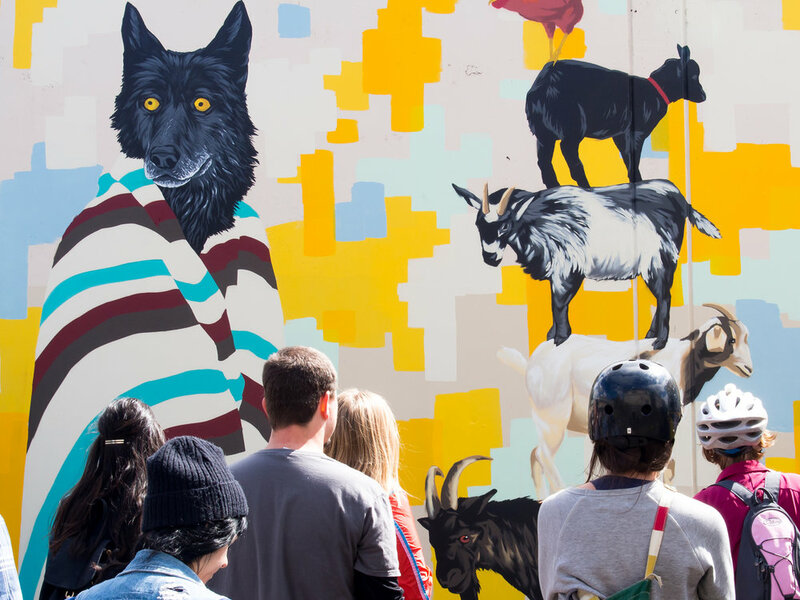 Join us for interpretive Experience Tours exploring some of Portland's best street art! During tours, PSAA directors speak about the city's rich history of murals and graffiti art, active community projects, and a range of topics related to street art, graffiti, and the politics of public space. Often, surprise artist speakers and mural painting happens along the way! Try your hands at rattle cans! This 3.5 hour Experience Tour also includes a painting tutorial by a local artist who demonstrates the basics of aerosol art. You will learn spray-painting techniques and then have the opportunity to put your newfound skills to the test! All participants also receive a free bag of hand-made stickers created by local artists. Your participation supports local artists! All proceeds pay tour leaders, participating artists, and support PSAA's community work. * For those of you living in Portland, if the cost of the Experience Tours is prohibitive, PSAA offers free public tours during Pedalpalooza, and free/discounted tours to local school groups. If there are any spaces available on the Experience Tours, day-of spaces will be provided to locals in exchange for a sliding-scale fee (pay what you can).